The Wine Academy of Spain, an educational organization run by Pancho Campo (Spain’s first Master of Wine) stopped in San Francisco last week as part of a US tour currently wrapping up in Washington DC. I joined a group of Spanish wine enthusiasts for the three day seminar that covered all of Spain’s regions, grapes and winemaking styles. I got to brush up on my Spanish wine knowledge and tried many new wines as well as some familiar favorites. Esteban Cabezas and his crew did a fabulous job of squeezing a ton of information into a short space of time. I gleaned all sorts of tidbits of information that I will be sharing with you in the days and weeks to come. My thanks and appreciation go out to The Wine Academy of Spain and to Catavino for sponsoring my attendance to the seminar (I won the scholarship for my why-I-love-Spanish-wine blog entry). Hopefully I passed the exam and in a few weeks will have a handsome Spanish Wine Educator certificate to hang on the wall. I retried a few wines at the Wine Academy of Spain course that are making a repeat appearance here as a result of a good showing at the seminar. Check out this week’s wine notes for the Aria Brut Cava, Gramona Imperial Cava and the red Fra Guerau Monsant. They are now back in stock and drinking beautifully. Last Sunday the San Francisco Chronicle ran a feature on the Spanish wine & food walking tour that I do called TapasWalk. Using my tour as an example, Janet Fletcher wrote a detailed piece on the burgeoning tapas scene now happening in downtown San Francisco. “In this new little world straddling North Beach, the Financial District and Russian Hill,” Fletcher wrote, “a Bay Area tapas enthusiast with good walking shoes can do the sort of bar hopping that many Spaniards enjoy nightly.” She included a lexicon of useful terminology for those less familar with Spanish cuisine as well as a few recipes for traditional tapas that you can make at home (with a few ingredients from The Spanish Table, of course). If you missed it in the paper last week you can still read the article online here. In tandem with last week’s San Francisco Chronicle article by Janet Fletcher about the downtown tapas scene, Jon Bonné put together a detailed and up-to-date summary of the current state of Basque Txakolí wine. If you have yet to experience the distinct joy of Txakolí, this article tells you all you need to know to get started. We carry all the Txakolí wines and (just between you and me) we even have some of the elusive Txakolí rosado still in stock. The culinary traditions of Spain and Portugal are changing how we eat here in the USA. As these flavors work their way into the hearts, minds and palates of those of us not fortunate enough to have been born into these cultures, we learn to appreciate the new ingredients and preparations as well as the variations within specific regional styles. As soon as we discover the distinct joy of, for example, Paella, we learn that this iconic Spanish dish is made in dramatically different styles from one part of Spain to the next. “Paella must include chorizo” says one expert. “Paella must never be made with chorizo” says another. According to many regional cooks “Paella made with anything other than rabbit and snails should not be called Paella”. And so it goes, with each individual cook claiming the mantle of authenticity. Wines too can be the subject of passionate debate due to the numerous stylistic choices made by Spanish and Portuguese winemakers. ‘Tradition’ versus ‘Innovation’ is just the entry point into detailed discussions of style and character within a specific wine region. At The Spanish Table we like to offer a broad choice to fit every palate, so we try not to take sides. To use this week’s wine selections as examples, we have a new Vinho Verde that offers a fresh new effort from a traditional winery. We have a new Txakolí that may change a few perceptions about what Basque white wine can be. Our newest red wine discovery comes from the Vinos de Madrid region, yet tastes unlike anything else we have previously tried from this part of Spain. So please enjoy our newest selections in wine, knowing that there is more to choose from, with new discoveries arriving every week. Steve is a veritable treasure trove of food and wine esoterica. He has accumulated much of this knowledge in his new cook book. Stop in on Sunday August 9th at 1 pm (or Saturday August 8th in Mill Valley) to quiz him on what (and where) to eat in Spain and Portugal. While you are here you can sample his famous Paella (that’s right, FREE paella!) 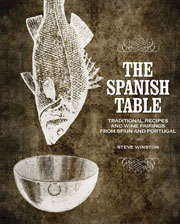 and pick up a signed copy of The Spanish Table Cookbook. At The Spanish Table we are always on the hunt for new wines to bring in and share with you. Sometimes we try something in a restaurant or bar that makes us start writing tasting notes on the back of napkins. Other times an eager salesperson will arrive at our door with something exciting and new. Only rarely will a trip to a large wine tasting event turn up anything of particular interest. With hundreds of wines to taste, those particularly unique or special bottles often get lost in the crowd. Over the last few weeks I have found several wines that are the happy exceptions to this general rule. At Viniportugal, a tasting of new Portuguese wines, I tried many distinctive (and well priced) wines that are already starting to appear here on our shelves. The Vinho Verde rosé (yep, pink Green Wine) that arrives this week is a perfect example. A dry Moscatel from Malaga was the revelation of the recent portfolio tasting of the wines from importer Jorge Ordoñez. Finding uniquely tasty wines is one of the things that makes my job fun, just as finding these same wines on the shelf at The Spanish Table is one of the reasons that shopping here is so much fun. I like finding unique wines. You like buying unique wines. What can I say? It’s a symbiotic relationship. On Sunday, surprise Mom by not making her breakfast. Spread the butter on both cut halves and fill with the ham and cheese. Close the sandwich and grill lightly, just enough to warm the bread, on your electric panino toaster (don’t have a panino toaster? Use your “George Foreman” grill instead, turned to low). Serve with a small green salad and a glass of rosado. For many of the less technically inclined among us the on/off button is our solution to all electronic device issues. Everything has them these days (computers, phones, televisions, even cars). When in doubt, start over from scratch by turning everything off and back on again. The circle with a vertical line sticking out from the top is the modern ideogram for renewal (not, as I first imagined, the international symbol for coconut with a straw in it). After a busy holiday season and a brief break from the newsletter action (by the end of December I was all talked out so I took a few weeks off for some personal defragmentation) it’s time to hit the restart button and share anew with you the ongoing excitement of the Iberian wine world. New wines from Spain, Portugal and Latin America are arriving weekly here and the year ahead looks very promising. Improved currency exchange rates and lower fuel costs are leading to some price reductions in imported wines while the current renaissance in Iberian winemaking is both fostering innovative new wines as well as creating markets for traditional styles that were previously unknown outside their regions of origin. At The Spanish Table we continue to bring you a selection of high quality wines at all price levels. In the year ahead we will also post more recipes, offer additional classes and organize new events to share the distinctive flavors of Spain and Portugal with you, our loyal customers. This week brings a new version of a traditional recipe, the announcement of an upcoming class that we offer only 3 times a year and the release of some of the most anticipated wines of the season. Onward! Lentejas Con Chorizo (Lentils with Chorizo sausage) is a popular home-style dish in Spain. This dense, meaty stew is perfect cold weather fare. I have lightened up the texture to create a soup that delivers the same flavors in a brothy version more appropriate to our moderate climate. This soup can be made in a vegetarian version by omitting the chorizo and adding a bit more smoked paprika. Rinse the dried lentils under fresh water to remove any dust or dirt. Cut the onion in quarters leaving the skin on. Roughly chop one of the ribs of celery. Combine the rinsed lentils, bay leaf, onion and celery with 2 quarts of cold water in a soup pot (preferably a Spanish earthenware olla). Bring the pot to a boil on the stove and then simmer for 30-45 minutes or until the lentils are just cooked through. Remove and discard the bay leaf, onion and celery. Finely dice the leek, carrot, remaining celery and chorizo (if using). In a separate pan heat the olive oil and sauté the diced vegetables and chorizo for 5 minutes. Add the salt, pepper, cumin and paprika to the pan and sauté the spices briefly to release their flavors. Add the contents of the sauté pan to the soup pot and simmer for another 30-40 minutes. Mince the parsley or cilantro and add to the pot along with the Sherry vinegar. Adjust the salt to taste and serve with grilled whole grain bread and a nice bottle of red wine. Paella Class: The first paella and wine class of the year is coming up at Kitchen on Fire cooking school here in Berkeley. The date is Monday February 23rd at 6:30 pm. The cost is $65 per person and includes hands-on instruction to create several tapas and a large paella mixta, all of which will be consumed during the class. Several paella-friendly Spanish wines will also be sampled. Kitchen on Fire is handling the signup for this fun and popular class. Go to their website for more details. It will come as no surprise to you, brave readers of this newsletter, that the food and wine traditions from Spain are currently quite popular on this side of the Atlantic Ocean. Thanks to retailers like The Spanish Table, many unique and delicious Spanish products are finding their way into American kitchens and dining rooms, often for the first time. In spite of all the recent attention, some of Spain’s regional specialties are still hard to find in the USA. The famous Pata Negra ham, for instance, has only just become available here. Wines from lesser known regions are found only in specialty shops like The Spanish Table. One product that has been noticeably absent from the US market is the traditional hard apple cider from Spain’s northern coastal regions, specifically the sagardo (sidra in Spanish) from the Basque region along the border with France. Happily, this tart, yeasty farm house cider has begun to take hold here in America. A few weeks ago I announced the arrival of the Basque cider made by Bereziartua, fulfilling a multi-year quest to find, buy and offer this product for sale to our customers. Today we have just received yet another sagardo, this one by Isastegi. Add to this the traditional sparkling cider from Asturias in three styles (one hard cider and two non-alcoholic versions) that we have carried for years and together they constitute the largest collection of sidra/sagardo on the west coast. “So what’s the big deal with cider” you may ask? Like Manzanilla in Jerez or Txakoli in Basque Country, the sagardo tradition is best experienced first hand. The place to learn about this traditional beverage is at a Sagardotegi, the typical cider mill that can be found all across the Basque region. These businesses are usually part family residence, part cider mill and part seasonal restaurant. In the springtime, barrels of freshly fermented cider are tapped for thirsty crowds that gather for a taste of the new vintage as well as for the traditional Sagardotegi meal of omelets, salt cod with fried green peppers, thick bone-in rib eye steaks grilled over charcoal and walnuts in the shell with honey and cheese for dessert. This meal is usually eaten standing up so as to accommodate frequent trips to the barrel room for refills. To get an idea of how this works, check out this video made at Bereziartua Sagardotegi. To acquaint yourself with (or revisit) the true flavor of basque sagardo, come pick up one of our two new brands of hard cider and pour them with the following recipe. Heat the olive oil in a 10” clay cazuela (or sauté pan). Add the sliced onions to the oil and sauté over medium heat for 5 minutes until the onions get soft and start to brown. Slice the long, skinny chistorra (sometimes spelled Txistorra) into bit sized pieces and brown lightly in the hot oil for about 6-8 minutes. If you are using a clay cazuela, bring the cider and bay leaf to a simmer in a separate pan and then add the hot liquid to the cazuela (adding cold liquid to a hot cazuela can crack it). If you are using a sauté pan you can add the cider straight to the pan without preheating it. Simmer the sausages in the cider for 20-30 minutes until the liquid is reduced by half. Serve hot with some bread on the side to sop up the juices, and more cider to wash it all down. El Gaitero in Asturias makes several non-alcoholic apple ciders that are very similar to the regular El Gaitero in flavor, but without the booze. Pretty champagne style bottles with old style labels on the outside, lots of bubbles and sweet apple flavor on the inside.